For the last four years the Federal Reserve has been actively engaged in supporting the stock market by suppressing interest rates to historically low levels, and injecting liquidity into the financial system, through a variety of different programs. The most notable, and widely discussed, of these programs has been the Large Scale Asset Purchase programs(see here and here) which have become known as Quantitative Easing or Q.E. There are two important considerations revolving around Q.E. programs. 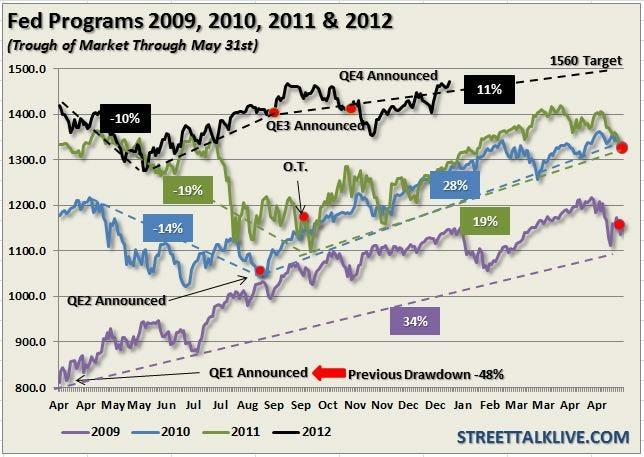 First, the Fed is currently simultaneously involved in two Q.E. programs totaling $85 billion a month. Considering that we are more than 4 years into an "economic recovery"the need for such liquidity injections is very telling about the real strength of the economy. Secondly, each program has had a diminishing rate of return as shown in the combined chart below.